I'm back with more updates over on the laundry room front! Today is all about our vintage sink and DIY countertops. Last we talked I explained that Brent made a wood top and back splash/ledge to cover the dryer outlet + the access hole on the side of the washer/dryer cabinet. Well, we got the wood top secured into place and then set out to DIY ourselves some concrete countertops. The plan was to use the Ardex Feather Finish to achieve the look. It's a pretty simple process, mix the powder with water, stir and then apply over top the wood tops. The entire wood top + the back splash/ledge (separate piece) was covered with the Feather Finish and then left to dry. As you can see the texture is kind of bumpy and rough, but once it was all dry the next step was to sand everything smooth. With this product you can apply, sand and then apply again and sand to get your desired finish. Lucky for us, we were happy with the end results after only one coat and one sanding spree. We have DIY'ed ourselves some real concrete countertops with our outdoor kitchen (read all about that here...Croix ate concrete at 6 months old... GASP!) and it was BRUTAL. This was way easier, cheaper and honestly, gives a much more finished look. Let's bounce to the other side of the room. The room originally came with a plastic utility sink. It was a good sink and we used the heck out of it, especially when washing out paint brushes. When we got the room cleared out for the tile demo we decided to remove the sink and start the process of looking for a replacement. We talked about several options, the two primary ideas being - making or having a cabinet made to hold an apron sink or purchasing a wall hung sink. We liked the idea of the added storage with the apron sink idea, but the all in cost once you purchase the sink and then either the materials to make the cabinet and or the cabinet itself just started feeling expensive. And the wall hung option was no different. Some of the wall hung sinks we looked at were over $1k which was NOT in the budget for a laundry sink. We kind of put the sink on the back-burner with bigger fish to fry when I remembered Scott's Antique had sinks. Old, dust/rust covered vintage sinks. Lucky for us Scott's was in town a few weekends ago so we loaded up our crew and headed down to see what we could find. We found two whole rows of options in various sizes and condition and plumbing orientation. While several of the options would of worked we really liked the 51" cast iron sink with side washboard. A classic. It was listed as $425 but Brent was able to get the guy down to $300. Way, way less than a brand new sink and this one was a true vintage piece with history and grit. It was perfect and we were so excited to get it! Once home we started working on getting it all cleaned up. We started by simply wiping it down with soap and water. Then, we used CLR to remove all the rust. Once this step was done the plan was to get the sink mounted and then paint it with porcelain paint in place. ... and thankfully it was! With all the rough-in plumbing in place it was time get the faucet hooked up. We found the perfect vintage-esque polished wall mount faucet here. Not only does the sink give off a really cool retro vibe but it provides another counter space for me to stack folded clothes on AND it's the perfect location to sit my plants that need to drain when I water them once a week. I mean gosh, does it get more charming? As the pool finished up late last year we really started talking about the exact location and specifics of the shed. We have a second driveway because our house currently sits on what used to be 2 lots. At the top of the second driveway we had a fence put in for safety reasons as it relates to the pool, but in doing so the perfect section of land was created behind the fence for the shed. ... and put posts in each one. We filled the holes with concrete around the posts and then covered that with dirt. We let the posts dry over night and the next day we got the frame around the posts put in. I made marks on the frame every 16" and then Brent and Croix cut the floor joists on the saw. Once they were lined up on the marks I made we nailed them into place. We cut smaller pieces to install horizontal for added rigidity. That's as far as we made it today, but not too bad for 1.5 days work with a "helpful" 3 year old and a baby brother who likes to eat every 3 hours or so :) In all seriousness this project is really going to be great from an organization standpoint and I think it might be kind of cute too - bonus! We are rolling right along on our laundry room remodel! Things started getting pretty a few weeks ago when the floor tile got installed! Black and White Checked Flooring!!! 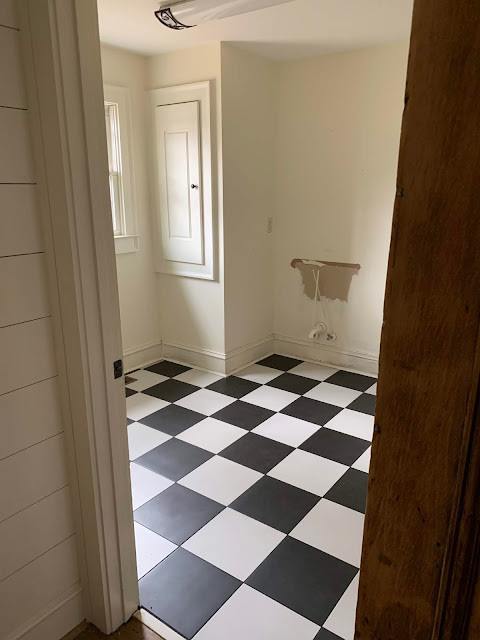 I have long dreamed of a black and white checked floor. I just love the classic vibe. The tile came from The Tile Shop and was $3.50 a piece (each tile is 12"x12"). I went back and forth on the grout color, but decided on black and I'm so glad I did. Not only does it just "go away" which is what I had hoped for, but the black grout will be SO much more forgiving as this room gets used. Like the Guest Bath Remodel, we decided to hire out the tile work for this space. This room will be a combination of hired out + DIY, but we have learned, for us hiring out the tile work is well worth the money. The guys got to our house around 10:00 a.m. and by 4:30 the existing tile was removed and the new tile was down AND grouted. The tile installer had to come back the next day to clean things up and re-install the shoe moulding, but 90% of the work was done in 6 1/2 hours. You just can't beat it! Now, let's talk storage. A few weekends ago we DIY'ed ourselves some laundry room cabinets! And this is where we we ended up at the end of the first weekend! We had a few issues to overcome to achieve our desired layout. First was the location of the dryer vent to the outside. We knew the base cabinet would need to be pulled forward to leave a void for the vent to run from the dryer to the outside of the house, but the location of the duct was an additional 6" off the back wall which caused depth issues for the base cabinet. You see, if we brought the base cabinets out to cover the vent, the base cabinets would be deeper than the washer and dryer cabinet surround. This wouldn't have been the end of the world, but it is always ideal for any cabinetry that will receive countertops to run into a cabinet or wall deeper than the countertop for a clean intersect. Luckily Brent was able to cut into the sheetrock and move the duct pipe back towards the wall a few inches allowing the base cabinet to be 24", pulled off the wall 7" to sit a few inches behind the washer and dryer surround. Brent also angled the corner of the base cabinet so as to allow the duct to connect easily. Brent cut a hole in the side of the tall cabinet to pull the duct through. The other issue was the plug for the dryer. The outlet was located above the base cabinets, but we knew we could use the hole cut in the side of the washer and dryer surround to pull the cord through. We even found an extra long cord on-line to ensure it would reach. The problem was that the outlet was falling above the height of the countertop. At first we thought about just boxing in around the outlet and creating a shelf, but then we realized we needed to be able to access the outlet so if we ever need to unplug the dryer or if we ever decided to replace it, we could get to it easily. We pondered on a solution for awhile, when Brent came up with the idea to box around the outlet with a shelf/ledge, but a shelf/ledge on a hinge that could flip down for access. It's genius! He got it all constructed, but I don't have a picture yet. We are working on the countertop material for the counter + this shelf/ledge area now, so I will show you more soon! As for the color, Brent and I both liked the idea of green cabinetry against the black and white flooring. To figure out the exact shade of green we bought 3 different options - Boreal, Alpine Trail and Pine Mountain all by Behr and then tested them out on this new-to-me product - SureSwatch. Each packet comes with 3 sheets and you paint your color right on the film. Once dry you peel it off and stick it right on the wall. This was super helpful in narrowing down the right choice. Right off the bat Alpine Trail was too dark. We went back and forth between the other 2 for a few days, watching how the colors looked at different times of day as the natural light changed. We really wanted the color to read as green, not a gray that had green undertones or a green that was so dark it could be black, and Boreal seemed to fit the bill best. So, we got the cabinets all primed and painted, working on the painting off and on all week after work last week. We are VERY happy with the color. It's the perfect shade of green, happy and bright whilst still adding some drama against the black and white floor. We love it! Once all the paint was dry it was time to get the washer and dryer all hooked up and in place. In order to stack the appliances we purchased a "stacking kit" on-line. It was really easy to install and we had the washer and dryer stacked, hooked up and slid into their new home in less than 20 minutes. This new set up makes the room feel SO much bigger! We still have a ways to go but I'm so happy to have the washer and dryer up and running. I never thought I would be so thankful to be able to do laundry - ha! I'm here today to introduce you to our first project of 2019 - THE LAUNDRY ROOM!!! This is the first of two projects we have in the works over here on the home front and I'm SO EXCITED!!! If you remember, this laundry room was one of the rooms I was the most jazzed about when we moved in to this house. Our last house didn't have a real laundry room. Just a little pad in the basement for the washer and dryer. It was dark, damp, scary - not a happy place to spend a lot of time. But the laundry room in this house is conveniently located on the first floor, HAS A WINDOW, a laundry shoot and is a decent size, so I have been thankful for it everyday, despite it's blah appearance. This room had a lot of potential but it also had some flaws from a layout perspective. There were 4 doors in this laundry room, 3 of which swung in at each other when opened. We removed the entry door and replaced it with an antique barn door we refurbished last year during our mudroom project. This definitely helped the situation, but the two doors covering the linen closet still made the space awkward. On top of the doors, this room (like the future home office space) had become a catchall. In addition to the obvious, washer, dryer, hampers and sink this room housed a freezer a table saw, table saw stand, two vacuums, boxes of office supplies/documents that were never unpacked from our move (3 years ago...gasp! ), cleaning supplies, beer making jars and buckets and other random odds and ends that I would just shove in there to get them out of my way in our main living area. It was a hot mess. Earlier this year we started talking through how and where to organize all of this stuff and decided everything currently in the laundry room would either be going to the linen towers in the guest bath (towels and sheets) a shed that we plan to build in the backyard (table saw, misc. tools, paint gun, etc. ), the home office (giant box of files, paper and office supplies) or would be staying in the laundry room. Even with a lot of the items getting moved out of this space we still had a good deal we needed to store, so we decided the best plan of attack was to remove the french doors covering the linen closet and then build out the shelving inside. The closet came with two wire shelves, leaving a ton of wasted space. Up until this point I had always housed my rolling laundry hamper in this closet, but in order to really optimize the storage this thing needed to go. That's when we decided we would stack our washer and dryer and then build out some shelving to the right of that to house laundry baskets. There will be a countertop on top of the shelving for me to use as a folding area and a hanging rod overhead attaching from the side of the washer and dryer surround and the wall. The linen closet will get built-out with nothing but shelves all the way up. SO MUCH STORAGE!!! A few weeks ago the freezer died (with stuff inside - UGH!!) so he is gone now too. This side of the room is still somewhat of a question mark as we decide what type of sink to get and if we will go back in with another freezer, a second refrigerator or maybe nothing? Still some details to figure out, but TILE STARTED TODAY so we are rolling full steam ahead! Don't forget to follow along on instagram for all of the behind the scenes happenings between now and the next post! Jumping upstairs to Croix's room to show off his new curtains and light fixture!! Let's start with the curtains...I swear curtains make a room come to life. This space has been getting happier with every added element, but the curtains really made it start to feel cozy and inviting. As for the selection of said curtains, I'm happy to report they were super inexpensive! Of course, I can't help but dig deep into the options, so I visited several fabric stores and got a ton of samples to consider. As nice as a lot of them were none of these options felt right. I loved the bright colors and happy prints of some of them, but I didn't want to make the room too baby-ish or even kid-ish. Obviously it is a kids room and I want it to be happy but I don't 'want the boys to come to me when their 8 asking for something more mature. On the other hand some of the dark grays or even the plaids just felt a little too formal. That's when I decided a solid curtain in a fun color was a better direction. Of course this took me down another rabbit hole of options, so I was very excited when we happened upon yellow, velvet curtains at Ikea for a steal. We picked up a metal rod on the same day and by the end of the weekend the curtains were up. Next up was a new light fixture. Like every bedroom in our house this one had a ceiling fan. Functional, yes - pretty, not so much. The room needed to be anchored by something more fun, but it took me awhile to find the right thing. I wanted something oversized and cool but at a price point that wouldn't break the bank. I found the perfect light but the lead time was 8-12 weeks, ugh. So I continued the search to no avail. We finally decided to just pull the trigger and guess what...the light came in way earlier than expected. I slapped the ceiling fan on Craigslist and Brent went to work installing the new light. Once up we were in love. It's the perfect scale, color and vibe and adds a splash of modern flair to the room. With these additions the whole space really feels equal parts cool and kid and I'm so excited with the way the whole thing is coming together. 5 Tips for Growing Your Fiddle Leaf Fig + a GIVEAWAY! Back in January I posted a photo of my living room over on Instagram and got a lot of questions about my fiddle leaf fig tree, so I did a few Instastories talking about the steps I take for caring for and growing my trees. I thought I'd list them on here too for anyone who missed the instastories and is interested. Now, let me give a little disclaimer here. My thumb has definitely gotten greener over the years but I blame that on dumb luck, some good advice and a house with really good natural light. I'm no expert, this is just what has worked for me! 1. Place your fiddle leaf fig near a window that gets good sun. This is #1 for a reason because your little tree won't live to appreciate the rest of these tips if you don't find the perfect sunny spot for them to sit. If I ever see a green fiddle feaf sitting in a corner, I know it's fake because these plants will quickly start to die if they don't feel the sun on their leaves. 2. Water the plant once a week on the same day. I really believe plants are like people in that they like routine and consistency. Overwatering a fiddle leaf fig can be as devastating, if not more so than under watering. A few years ago I picked Sunday as my watering day and try to water all of my plants on this day. This keeps me from second guessing and keeps the plants fed, but not drowned. 3. Don't move the plant. These plants are true divas and do not like to be moved. Once you find a spot for yours to sit where it thrives and seems happy, don't move it. 4. But do Twirl the plant. Like all plants the fiddle leaf fig tends to lean towards the sun, so every few months I twirl my tree so each side gets an equal amount of exposure. This keeps the tree from getting misshapen or leaning too far to one side. 5. If your plant does get a brown spot or you inherit one that already has brown spots, cut them off. I adopted three fiddle leaf figs last year. One sits at my house and two sit at the Bell Cabinetry & Design Showroom. When I got them, they were in bad shape and their leaves were riddled with brown spots. I ended up cutting off the brown areas, not the whole leaves, just the brown spots and while the leaves did look a little weird, the trees started getting healthier! A baby fiddle leaf fig tree that is! Plants make me so happy and I love having them scattered around my house, so whether you have a home filled with plants or this would be your first, I'm excited to be giving away one of these green pretties today! Leave me a comment letting me know where you would put a fiddle leaf fig tree in your house. If you tag a friend it's a bonus entry. I will pick a winner Sunday night! I plan to purchase the tree online here, so if you don't win - just know these trees don't have to be super expensive. You can Amazon Prime one to your doorstep or pick up one of the small ones from Home Depot (I got all of mine from there! ), I saw them the other day for $19.99. Next, use the tips above to grow your little fig into a tree taller than you! Good Luck! 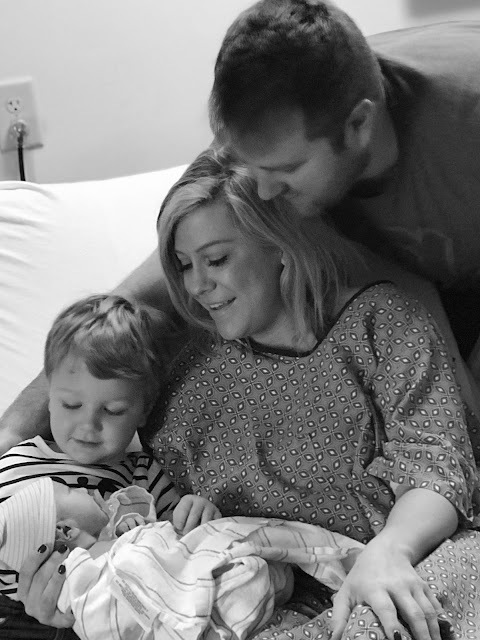 Well, we have some big news to share over here on the homefront, in the blink of an eye, 13 days early our January Baby decided to make HIS grand entrance on December 26th at 5:01 PM. For the second time I had a due date that was uncomfortably close to Christmas. If you know me, you know I'm kind of a date freak. Like, I have absolute feelings about certain numbers and birthdays and always swore my kids would have pretty dates. With my first pregnancy I was due on December 22nd and Croix arrived 5 days late on December 27th. This time, my due date was January 7th, a full 2 weeks after Christmas so all I wanted was #1 for the baby not to be born on Christmas, #2 for the baby not to be born on Croix's Birthday and #3 for the baby to be born in January so he/she could have their own birthday month. Well, 2 out of 3 wishes isn't bad, right? I swear, I plan and God laughs. Just like I did with Croix's birth I want to recount the day, because I love reading other peoples birth stories and I like the idea of documenting all the details while they are fresh in my mind so I can look back on them one day. No blood and guts, promise, just big picture details.. This pregnancy was very much like my first, I was nauseous (when I didn't eat) for the first 12 weeks and then felt it was pretty easy, and other than getting bigger and bigger I chugged along like normal. I will say I was more sore this time around. Like my body actually ached, my hips, my feet, I basically felt like a 100 year old at the end. One stroll around Target would have me dead on my feet for the rest of the day. My doctor said it was typical to feel more aches and pains with the second baby but that the labor/delivery would be faster and easier so I held on to that little fun fact. Fast forward to the last month of pregnancy. I was busy. We had several projects going on at home (Pool...Croix's Big Boy Room/Closet...Guest Bath Remodel) + work was crazy busy with tons of projects to button up and a photo shoot to knock out before the baby came. All of that on top of an always busy December with tons of gatherings, Christmas decorating, gift buying, etc. At the end of every day I was beat and I had this weird feeling early on in the month that if I didn't start trying to slow down the baby would come early. But then I was like, nah - I (like baby Courtney) + my sister was 2 weeks late and Croix was 5 days late, so fear not, I would not be early, nay it would likely be in the double digits of January before he/she graced us with their presence. I worked all the way up to December 21st, the Friday before Christmas. It was a slow day at the office as a lot of people had already taken off and my CAD Designer - Wanda and I worked ALL DAY. We sent out so many drawings and quotes, we didn't even eat lunch, we just powered through and I'm so glad we did because this would be my last day of work....until late February. The days leading up to Christmas were busy, but fun. My parents came into town on December 22nd and we did some shopping, some food prep, went to church, watched Christmas movies and just got all ready for the big day. 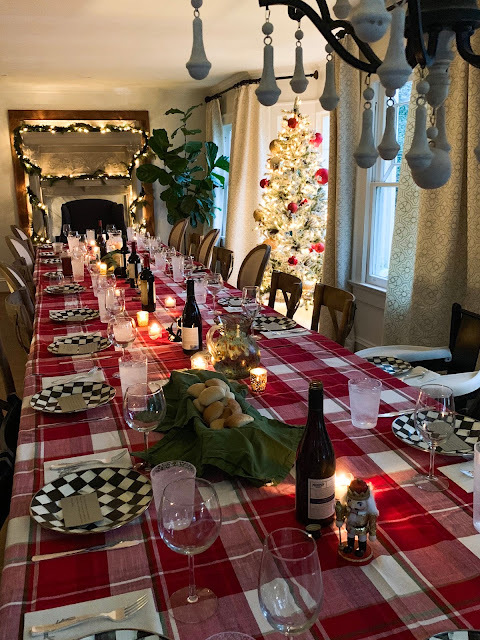 For the third year in a row we hosted Christmas dinner at our house. We extended our dining room table to hold 21 of us and it was so fun. I woke up feeling somewhat rested but a little off. Brent was having issues with his sinuses so I decided to head out to Publix to grab some medicine and a coffee for me and my Mom. When I got to the Publix parking lot I felt kind of crampy and actually waited in the car for a few minutes, hoping for it to go away. Well, it did and that's when it occurred to me... wait a minute...was that a contraction?! NO! It couldn't be....I got the medicine and the coffee and the cramps/contractions continued, but I was NOT HAVING IT. No this was not happening. I got home and realized it was garbage pick up day so I rolled the cans to the street, pausing to let another contraction pass and then headed inside. I think I honestly felt like if I just pretended like it wasn't happening, my body would get it's life together and stop this craziness. Nope....as soon as I filled Brent in on what was going on, he lept into action mode. Go take a shower, let's pack a bag, I'm going to go tell your parents. WHOA WHOA WHOA, what part of this isn't happening today was he not getting? Ha - I feel like I was the same kind of obstinate last time around. But it grew increasingly obvious that it was in fact happening so I slowly started getting my stuff together. We left for the hospital around 9:30am and by 10:52 am I was in a room and the nurse confirmed I was in labor and already 4cm. Around noon I got my epidural (hallelujah), around 2pm I was 7cm so the doctor broke my water and at 5:01 Lot was born. He weighed 8lb 0oz and was 20" long. Labor and delivery is no joyride but I felt a lot calmer this time around and the whole thing seemed to go faster and more seamlessly. For the first hour it was just me, Brent and Lot in what they call the Golden Hour. After that family was able to come in and meet our newest addition and while everyone was happy to meet Lot, Croix's reaction and genuine excitement took the cake. He was and still is SO excited to have a baby brother. Thanks to a pretty straightforward delivery my physical recovery has been a lot easier this time. My mental state has also been a lot better. I had struggled with some postpartum depression after Croix, but luckily there has been none of that this time around. I think a lot of it has to do with the fact that I had done this whole thing before and knew what to expect. I knew/know that while there may be moments of frustration, discomfort, exhaustion, etc...it's all very short-lived and will be over in the blink of an eye. It's probably my personality, but the knowing has made such a big difference and I'm so thankful for that.